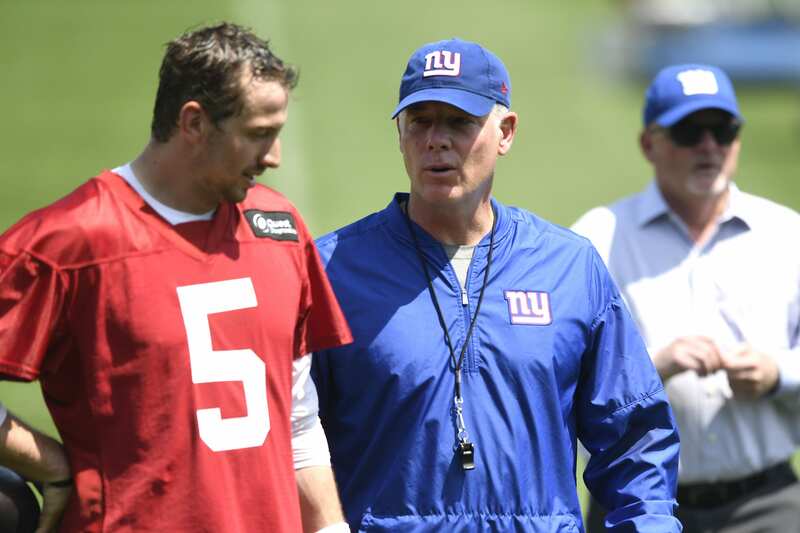 Home None New York Giants: When Will Davis Webb Be Ready To Become The Starter? Thoughts of the future are intertwined in every New York Giants fans head with the excitement for the present. Having a world-class running back and wide receiver to thread opposing defenses is front and center for the Giants, but the question remains: When will Eli Manning’s ticker run out of time? And will Davis Webb be ready? Offseason workouts provide the coaching staff a period of assessment, where they can break down their roster and begin to force competition to extract value and talent from players. Whittling down until the first-team is formed is the process the team must go through, but for Davis Webb, his spot on the roster is guaranteed. He will be the backup to quarterback Eli Manning, and his opportunity must wait until Manning withers away due to old age and declining talent. Webb has shown a great deal of improvement throughout the weeks, showing off his arm strength, accuracy, and talent commanding the huddle. Webb surely won’t be stepping into Manning’s shoes this season, unless an injury occurs; but having a dedicated backup that’s showing extreme improvement is exciting. He will get his opportunity to present his skill-set during the pre-season, and he might even earn some first-string time, but for now, he must wait idly by while Manning plays out the rest of his career. It’s possible Webb is forced to wait for another two season to get his shot, but he will be ready when the opportunity comes. Two or three seasons under Manning and a rebuilt offense will give him the tools and confidence to capture the starting job smoothly when his time comes. But for now, we can only break down his strengths and weaknesses. Let’s take a look at the pros and cons of Webb, as he very well could be the future of this franchise. Webb possesses a stellar mentality and has worked tirelessly to perfect his craft this offseason. He spent a majority of the summer working with trainer Tony Racioppi, who assisted in developing his footwork and arm mechanics. These tools are essential for a quarterback in the NFL, and seeing Webb not only work on the physical part of his game, but the mental, is ever-so encouraging. Often times, it’s not the physical attributes that hold a QB back, but rather the decision making and mental obstacles of being a passer in the NFL – breaking down defenses, moving through progressions, leading a receiver, timing, etc. These are all factors that require mental prowess, and they’re different for every scheme and player. Webb, luckily, has spent the time crafting his granular connections, which will help him succeed when he finally reaches the point of opportunity. Now, we’ve heard a lot of good things about Webb, but not many poor things. The media likely has a lot to do with that, but let’s be real, there’s still many things that need to be worked on. For example, Webb threw an interception during OTAs at the cost of a poor read. He needs to work on learning the movements of safeties and linebackers, as quality players will undercut routes and take him by surprise. Webb will continue to develop his eye movement and the unpredictability of his throws. In addition, the Giants’ backup quarterback needs to work on his medium range passing, as he’s still getting over the air raid offense he conducted at Cal. While he has a stellar long-ball, his passing over the middle can be refined. At only 23 years-old, Webb has plenty of time to fine-tune his skill-set. Head coach Pat Shurmur stated that he believes Manning has “years” left in his playing career, and if that’s the case, Webb will be waiting quite some time before he receives a chance to start. On the bright side, he will be ready when it comes.